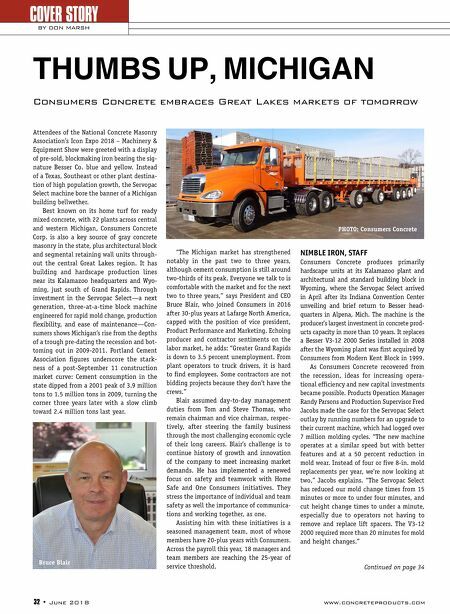 www.concreteproducts.com June 2018 • 33 COVER STORY CONSUMERS CONCRETE Seamlessly placed in the existing V3-12 2000 footprint at Consumers Concrete's Wyoming plant, the Servopac Select machine can run up to nine cycles per minute, depending on the product; yield three standard 8- x 8- x 16-in. block every 6.7 seconds; and, mold units from 1- to 12-in. high. Mold vibration uses electronic servo drives, which offer the capability to change the motor speed/frequency on the fly from the operator control station. That feature contributes to the Servopac Series' extension of mold life by up to 50 percent compared to V3-12 machines. PLANT PHOTOS: Concrete Products In lieu of large cams typical of V3-12 vintage, key Servo- pac Series functions are now controlled by hydraulic pro- portional valves and hydraulic cylinders equipped with electronic position sensing devices. 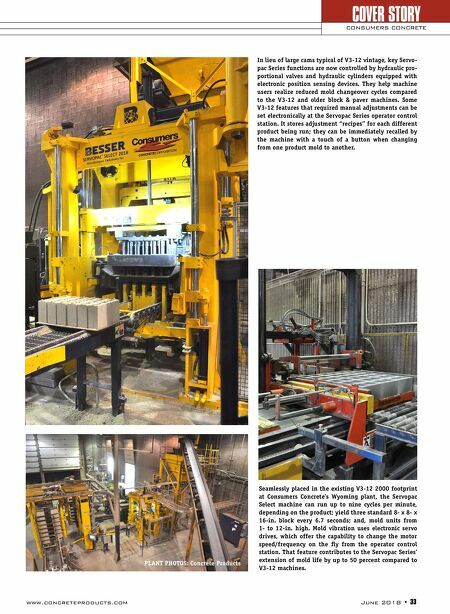 They help machine users realize reduced mold changeover cycles compared to the V3-12 and older block & paver machines. Some V3-12 features that required manual adjustments can be set electronically at the Servopac Series operator control station. It stores adjustment "recipes" for each different product being run; they can be immediately recalled by the machine with a touch of a button when changing from one product mold to another.